Do you need the convenience of a shipping container in Payson, UT? Perhaps you’re considering remodeling your home and need temporary storage that’s accessible and secure. Whatever the reason, Haulaway Storage Containers has everything you need and more! After more than 45 years in the storage container business, it’s safe to say that we’ve perfected our art. When we first opened our doors to the public in 1958, Haulaway Storage Containers specialized in offering temporary storage containers to the construction industry. Since then, we’ve grown from a small business with just one truck and ten containers to the multi-state operation that we are now. Serving throughout the Western United States, Haulaway is who you need to call when you need a shipping container in Payson, UT, California, Arizona, Nevada, Colorado, Washington, or Oregon. 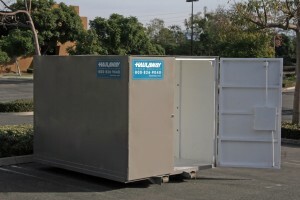 We know you might be wondering, what possible uses of a storage container rental are there? Why not just rent a storage unit instead? For one, our steel shipping containers are delivered directly to your home or business. That means you have access to your belongings at all times with no drive or hassle. There are simply so many uses and applications to our storage containers. They’re often rented and used by hospitals, offices, schools, and government buildings. In addition to office, retail, residential, industrial, and construction uses, the potential applications are endless. Don’t know where to start? Give us a call or fill out our online form for an instant quote on your project. We’ve got a variety of sizes and secure options for you to choose from. You’re just a short inquiry away from receiving your shipping container rental for your Payson, UT home or business!